● POOR FIT: gloves currently being sold as gardening gloves often do not fit very well, particularly those sold as ladies. ● UNCOMFORTABLE: many existing gardening gloves can be fairly cumbersome and uncomfortable. ● NO FEEL: there is limited dexterity in most of the current products, resulting in a lack of feel, because often the leather used to make these gloves is industrial grade leather which tends to be fairly low in quality. ● UNATTRACTIVE: the appearance of most current gardening gloves leaves a lot to be desired. 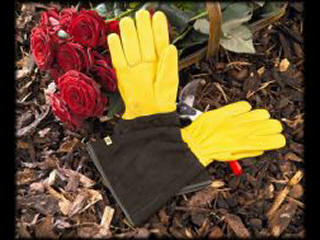 The new Gold Leaf Gardening Glove range solves all of these problems, by bringing together some unique and innovative designs, made from exceptionally high quality leather (usually only seen in very expensive fashion gloves), which is both comfortable and durable. We have spent over two years designing and refining the different styles and packaging in order to ensure that Gold Leaf Gardening Gloves are quite simply, the very best ever seen. Our new range has been designed specifically for gardening, rather than as general purpose gloves, and we are confident that we can at last offer gardeners gloves which are unique and which they will enjoy wearing. Click on the glove names below to read more about each type of Gold Leaf Glove, or click on the video for a short audiovisual presentation on each style.